Wiper blades are primarily used to remove rain or ice from your car’s windscreen, so that you can drive safe. Sparesbox stocks an extensive range of wiper blades from two of the most trusted wiper blade manufacturers worldwide, Bosch and Tridon. What do Wiper Blades do? Wiper blades are chiefly responsible for making sure your visibility is at its peak in wet conditions. Made of plastics and rubber that age and have the potential to collect dirt and grime very quickly, wiper blades are one of the most frequently swapped out components of your vehicle. Aerodynamic and hydrodynamic elements combine to ensure that your windscreen wiper blades glide through the air cleanly and disperse every bead of water from your windscreen to leave crystal clear quality of vision. Why is it Important to Change Your Wiper Blades? Many vehicle manufacturers recommend changing wiper blades with every service interval, 6-month or 12-month period that you drive your car regularly. Failure to do so can result in the smearing, juddering and creaking that comes with wiper blades that aren't smoothly sliding over the surface of your windscreen. This is generally accompanied by poor visibility and a streaky finish on your windscreen, not only while it's raining but also after the bad weather has passed. The difference between new and old wiper blades is night and day: expect quieter operation, a smoother range of motion regardless of setting or conditions, and improved vision in rainy weather with a cleaner finish to your windscreen after the weather has passed, free of water spots and dirt. Sparesbox’s range of Tridon and Bosch wiper blades are made for the best possible performance. Bosch's aerotwin range of wiper blades combines all of these outstanding elements to provide outstanding performance and longevity, precisely German engineered to meet or exceed Original Equipment Manufacturer standards of quality by one of the world leaders in automotive components. 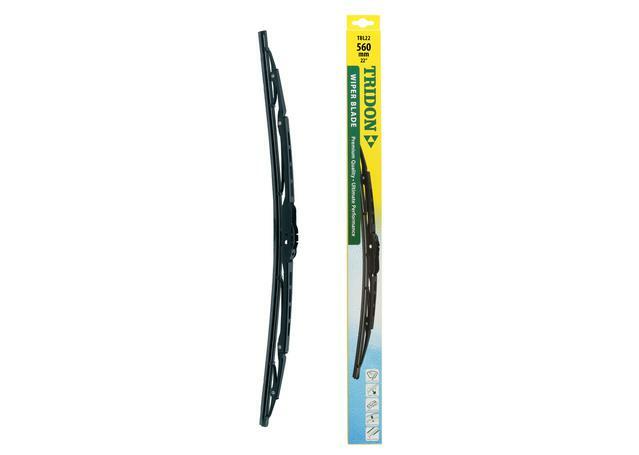 Tridon Wiper Blades are manufactured to the highest quality offering smoother operation and longer service life.